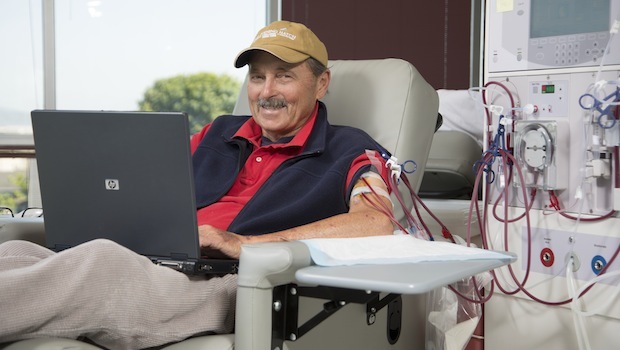 In-center dialysis works best for many patients with chronic kidney disease. If you choose in-center dialysis at one of our six locations, you will likely receive treatment three days a week, for about four hours at a time. You will get to know your in-center dialysis team well and hopefully find comfort being in the same center, with the same supportive staff, each time you dialyze. How does in-center dialysis work? There are two types of dialysis for patients with chronic kidney disease: hemodialysis and peritoneal dialysis. While peritoneal dialysis patients receive training in a center, they then go on to dialyze at home. So when you hear the term ‘in-center dialysis,’ it is usually referring to hemodialysis. A hemodialysis machine is set up by a member of your dialysis team (a nurse or technician) using the prescription your kidney doctor (nephrologist) provides. When you arrive at the dialysis center, you will be asked to wash your dialysis access – either a fistula or graft – and weigh yourself. Your weight is continuously monitored as it will help determine the amount of dialysis you need. Once you are seated and comfortable, a dialysis nurse or technician will place two dialysis needles in your fistula or graft. These needles are connected to tubing that carries your blood to and from the hemodialysis machine, where it is filtered and cleaned. 4. Treatment is carried out. The dialysis treatment is carried out until enough waste and extra fluid is removed. Your nephrologist will monitor your blood pressure and lab test results to determine how long your treatment needs to be. Most in-center dialysis patients dialyze for about four hours at a time. During your treatment, you can read, watch TV, work on your laptop or tablet, take a nap or visit with a friend or family member. You need to remain seated during the treatment but a member of your dialysis team will be close at hand if you need any assistance. 5. Check weight and head home. After your treatment, you will be asked to weigh yourself again. This helps confirm that excess fluid has been removed during your treatment. The pressure is off you. With a full team of support staff on hand to help, all you have to do is sit back and relax. Your dialysis team will start and stop the treatment and be on hand should you need any assistance at all. Your home remains a home. If you dialyze in-center, there’s no need to take any dialysis equipment home with you. You go into the center three days a week and leave it all behind when you walk out the door and head home. You have an opportunity to socialize. There will be many other patients dialyzing when you do. Some of these patients will be on a similar dialysis schedule as you, so you’ll see the same friendly faces each time you come in. Get to know your peers and who knows — you might become lifelong friends! What can I do to prepare for in-center dialysis? You need to get a hemodialysis access before you can dialyze. The best access is an Arteriovenous (AV) fistula, a small device that connects an artery to a vein and allows for ongoing dialysis treatments. Your nephrologist will refer you to a surgeon who will place the fistula, usually in your arm. This procedure is usually done on an outpatient basis. Once you have your fistula, you need to wait for it to mature – usually three to six months. In the meantime, if you need dialysis right away, your doctor may suggest a graft or a catheter. What should I do when I arrive at the center? Arrive for your treatment 15 to 30 minutes before your scheduled session. This will allow enough time to check in with the receptionist, use the restroom, wash your dialysis access arm, weigh yourself, check your temperature and bring your belongings to the treatment area. What should I wear to dialysis? Plan to wear comfortable shoes and clothes when you come to the center. Choose a top that allows your dialysis access to be visible during your treatment. If you have a dialysis catheter, consider wearing a button-up shirt. For your safety, it is required that you wear shoes whenever you are walking around the clinic. Can I eat during dialysis? Depending on how you feel during your treatment, you may want to eat a light snack before or during dialysis. Check with staff in your center to see if they have any specific guidelines regarding eating during dialysis. What should I bring with me to do? Gather any items you may need, such as books, magazines, ice, water and snacks, before you go to the treatment area. You may bring portable electronic devices including iPods, notebooks, laptops and DVD players, to use during your treatment as long as you use personal headphones. We will provide you with headphones for the TV speaker at your chair and we have free WiFi access in all our centers. We will also provide you with one light blanket and a large canvas bag for you to bring other personal comforts, such as pillows and other blankets. Small lockers are available for you to store your personal items in while you dialyze. To keep your items secure, please bring a lock with you. Can I bring someone with me to my treatments? Visitors aged 14 and older are welcome in the treatment area once you are on dialysis. However, visitors may be asked to leave at any time if dialysis staff feels this is necessary.